This is the first time in 47 years that the home is on the market. 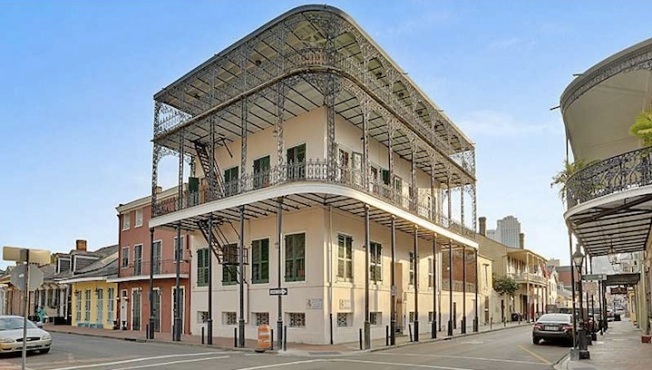 This large New Orleans mansion, formally as the Gardette-LePrete Mansion, is one of "the most photographed and admired properties" in the French Quarter, according to the listing. Though the listing does not explain why, an exploration into local lore will reveal a chilling story that might make potential buyers think twice -- or jump at the chance, if they're into that kind of thing. According to Curbed, in the late 1800s it was rented to the brother of a Turkish sultan who threw lavish soirees until one day blood was seen trickling down the front steps -- everyone, including the harem and entire crew, had been murdered inside. The sultan was said to have been found buried alive in the bak yard. The culprit of the crime is still unknown. The property was passed around among plantation owners, the New Orleans Academy of Art, and finally, to investors Frank D'Amico and Anthony Vesich Jr., who set about restoring the house and dividing it into six independent apartments. D'Amico's wife, who lived in the building's penthouse, reported seeing some paranormal activity, and D'Amico reported that a tree in the backyard was growing out horizontally from beneath a later addition, supposedly where the sultan was buried. Spooky! For sale for the first time in 47 years, the Gardette-LePrete Mansion is on the market for $2.65M. Read more about this unique listing at Curbed.